1.02.2016 – 01.02.16 – Soft electronics are changing the way robots can touch. 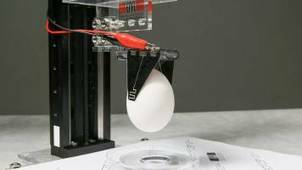 EPFL Scientists have developed a new soft robotic gripper – made out of rubber and stretchable electrodes – that can bend and pick up delicate objects like eggs and paper, taking robotics to a whole new level. I think that Grabit may be ahead here.